A new and exciting flowering standard for 2019! Rarely seen and unusual evergreen shrub. Provides fantastic year-round interest in your garden. Spiky deep green foliage throughout and bright red blooms from late winter to late summer. Supplied as a 90cm standard plant (including 3L pot) ready to plant out. We're really excited to bring you this new introduction for the 2019 gardening season - be one of the first to own this stunning Australian native in standard form. Grevillea juniperina is an unusual and rarely seen shrub and is hardy down to -10C so will thrive in your garden especially if you give it a nice sunny position and protection from the wind. The needle-like, mid green foliage is evergreen so the plant, which looks not unlike the familiar Rosemary, will provide year-round interest. 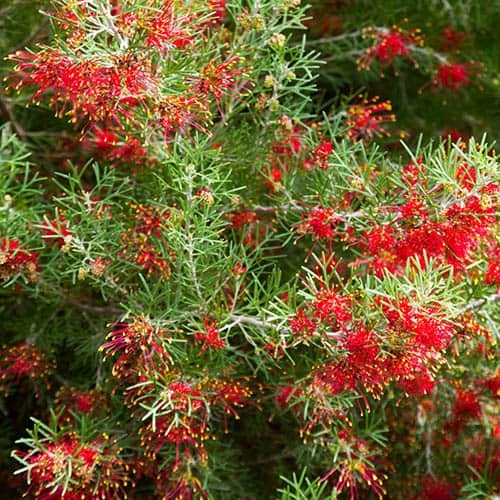 In late spring grevillea will thrill you with its display of blood-red, claw-shaped flowers which gives rise to the plant's common name of 'Spider Flower'. a superb display which lasts up to 3 months, this is a lovely plant for a large pot or south facing border, adding a real exotic touch to UK gardens, reminiscent of exotic summer holidays. Grevillea loves a sunny spot and well-drained soil yet is easy to care for and hardy throughout the UK - plant it the border or a patio pot and admire this lovely plant for years to come. Supplied as a 90cm standard plant (including 3L pot) ready to plant out, a light clip in the spring is all the pruning that you need to keep your plant in shape. Grevilleas can produce odd flowers almost right through the year, so it's not unusual to see them in flower spring, summer and autumn! They will grow well in poor, free-draining soil and don't like being waterlogged, so are ideally suited to raised beds or rockeries. Happy to grow in pots too on the patio or balcony, so you don't even need a garden to enjoy them! If growing them in a pot, add grit or sand to the compost to improve drainage. Prune lightly in spring after the first flush of flowers to keep plants looking at their best.